GENEVA, Oct 23 2014 (IPS) - As Juan Evo Morales Ayma, popularly known as ‘Evo’, celebrates his victory for a third term as Bolivia’s president on a platform of “anti-imperialism” and radical socio-economic policies, he can also claim credit for ushering in far-reaching social reforms such as the Bolivian “Law against Political Harassment and Violence against Women” enacted in 2012. “In many countries women in the political arena, whether candidates to an election or elected to office, are confronted with acts of violence ranging from sexist portrayal in the media to threats and murder,” says the World Future Council (WFC), which monitors the gap between policy research and policy-making. “For the first time we introduced the category of what are called visionary laws which aim to curb violence against women in politics and other professions,” he said, adding that the passing of such a law in Bolivia is “very significant”, suggesting that other should emulate the Bolivian example. The law against political harassment and violence against women was enacted in Bolivia by the Morales government following the assassination of Councillor Juana Quispe after she had complained about the abuse she suffered from other councillors and the mayor of her town. The law defines political harassment and political violence as criminal offences which carry imprisonment ranging from two to eight years depending on the magnitude of the offence. The WFC, which promotes the world’s best laws and solutions for implementation by policy-makers in countries all over the world, chose to offer the “honourable mention” for the Bolivian law in the visionary category. Based in Hamburg, Germany, the WFC was set up in 2007 to pioneer the campaign for the spread of best laws in different areas. Beginning in 2009, the WFC has been offering the Future Policy Award (FPA) for the strongest laws in the field of sustainable development. The WFC identified the Belo Horizonte Food Security Programme in 2009 as the best law for the FPA to address the right to food. In 2010, the FPA went to Costa Rica for the best law to strengthen biodiversity. In 2011, it was awarded to Rwanda for its laws to protect forests, and in 2012 it was awarded to the Republic of Palau in the Pacific Ocean for the best laws to protect coasts. Last year, the FPA went to the treaty for the prohibition of nuclear weapons in Latin America and the Caribbean. 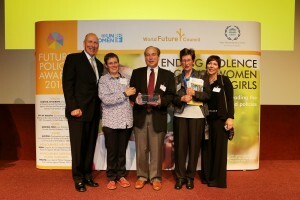 This year’s WFC gold award went to the “Coordinated Community Response to Domestic Violence” programme of the City of Duluth in the U.S. state of Minnesota. Among others, said von Uexkull, the “Duluth model” has a shared philosophy about domestic violence and a system that shifts responsibility for victim safety from the victim to the system. The “Duluth model” has helped countries formulate laws and policies based on the principles of coordinated community response and paved the way for the intervention of criminal justice in cases of intimate partner violence. Each year, an estimated 1.3 million women are victims of physical assault by an intimate partner. According to von Uexkull, such violence entails huge human, social, and economic costs which are estimated to be around 5.18 percent of world GDP. HBO (Home Box Office), a U.S. pay television network, has recently produced a documentary entitled Private Violence, which looks at domestic violence against women. In an interview with The Guardian, Cynthia Hill, the documentary’s director, said: “The thing that I did not know that was so revealing to me was that anywhere between 50 percent and 75 percent of domestic violence homicides happen at the point of separation or after [the victim] has already left [her abuser].”. To highlight the importance of enforcing and implementing existing laws to eradicate violence against women, the WFC gave awards this year to Austria and Burkina Faso for their stringent implementation of laws to protect women against violence. “When the justice system and specialised service providers work hand in hand, real progress can be made,” said von Uexkull. However, as countries are preparing to celebrate the 20th anniversary of the Fourth World Conference on Women in Beijing, there is not a single country in the world where we have succeeded in eliminating violence against women, warns Gertrude Mongella, Secretary-General of the Beijing conference, former President of the Pan-African Parliament and WFC Honorary Councillor from Tanzania.